Add elegant glow to your home with our Cactus Light: 1.Create a romantic atmosphere with warm white LED lights. 2.Can be placed on the table or has a hook to hang on wall. 3.Ideal for special occasions, events or everyday home decor, great for mantel, picture window, baby room or as photo/set props. 4.Uses 2 x AA batteries (not included) so needn't to worry about trailing wires or placing near a plug socket. 5.With ON and OFF switch, fast and easy to use. 6.An attention grabber and draw eyes as the apex of your wedding, party, special event, etc. Safe,Durable and Portable: 1. LED bulb produces no heat after long-time use. 2. Plastic exterior, sturdy but not too heavy. 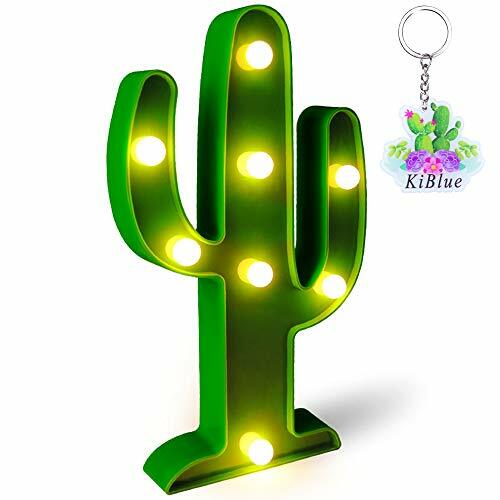 Specifications: Material: ABS Plastic + LED lamp Power Supply:2 x AA batteries (not included) Power: 3W Package Included: 1*Cactus LED Night Lamp1*Cactus Keychain Precautions: 1. Keep the light in a cool and dry place and remove batteries if product is not to be used for a long time. 2. Designed mainly for decorative purpose. Can't be used as a substitute of daily lighting. 3. If hanging, please ensure the hook has some extra space for easier operation ON/OFF switch. 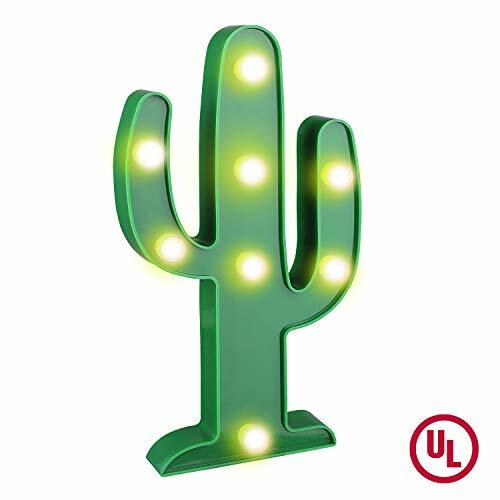 Description Color:Green Shape:Cactus Material:Plastic+LED lamp Size:9.5*5.5*1inches Weight:0.66lb Bulb:Warm white leds Power:3W Power:2AA batteries(not included) Application: Indoor and out door(must in dry weather) use, home or holiday decoration. There is a hole behind the lamp, can be hung on the wall, also can be placed on the table or any corner of the family. 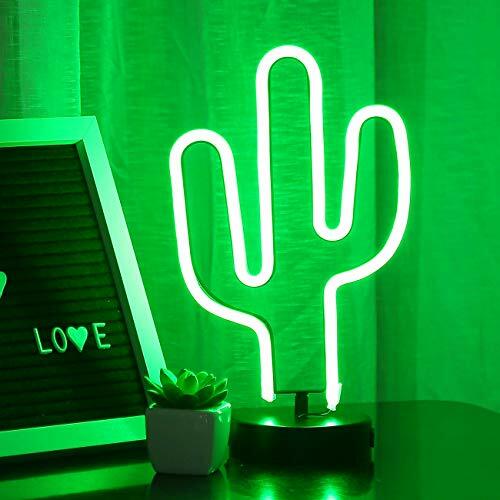 Add an elegant glow to your table decoration with our giant light up Cactus. This bright tropical light is the ideal eye catching addition to your party table. This product is safe and multi-functional,no wiring required, fast and easy to install.Safety in use,requires 2 x AA batteries (not included), ON and OFF switch on the side.Integrated hanging hook holes for ease of display on wall - As an exciting prop for restaurants, bars, and photo booths, etc. Pretty much anywhere you can think to use a sign. Light your life and have fun! Application : ◆Neon light is great for nightclub,parties, camping, bar decoration and so on. 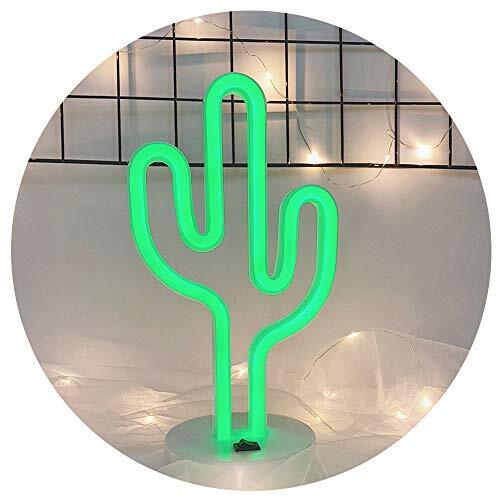 ◆Perfect for DIY decoration,hanging on Christmas tree, wall, shelf etc; ◆Also Used as everyday home decor, great for mantel, picture window, yard or as photo/set props.Create a warm and romantic atmosphere with this neon light. DURABLE & ENERGY-SAVING & ECONOMIC: ◆Plastic exterior, sturdy but not too heavy. EFFECT ◆Designed mainly for decorative purpose. Cannot be taken as a substitute of daily lighting. ◆Neon light produces no heat after long-time use ATTENTION ◆Please handle this product with care to avoid damage to the bulbs. If hanging, please ensure the hook has some extra space for easier operation on the switch. ◆Store the light in a cool and dry place and remove batteries if product is not to be used for a long time. PACKAGE ◆1 x Neon Light (batteries not included) ◆Buy Now Click Buy Now before we are out of stock! Balie Space is a company of manufacturing table lamp , flool lamp for many years. our animal table lamps,floor lamps are our unique design and very hot sale. our business have been growing up very fast , and many new design lamps will be showed up . looking forwards to !! 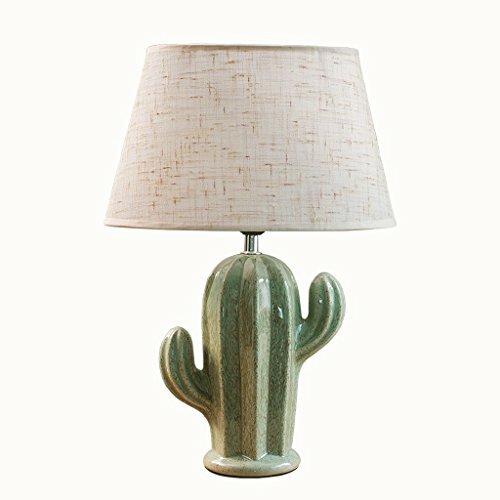 CACTUS LAMP FOR KIDS: Love the desert landscape style but have a black thumb even with cactuses? 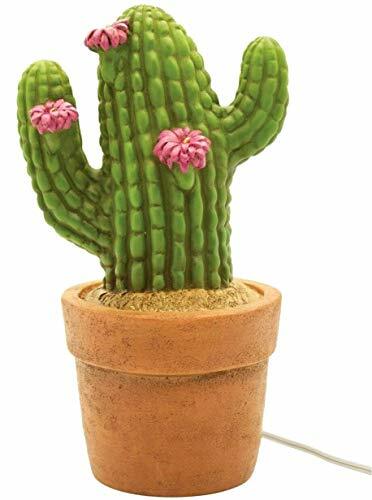 The Cactus Lamp can bring some desert to your decor with its realistic potted cactus look. Real cactuses don't require watering either but this lamp goes one step further and sheds light around your room too. Made from sturdy polyresin to look as cactus-y as possible, the Cactus Light comes ready for gifting. It fits into even small spaces with a height of only 8.75". Add in a 7W candelabra bulb will bring some desert glow to your home. 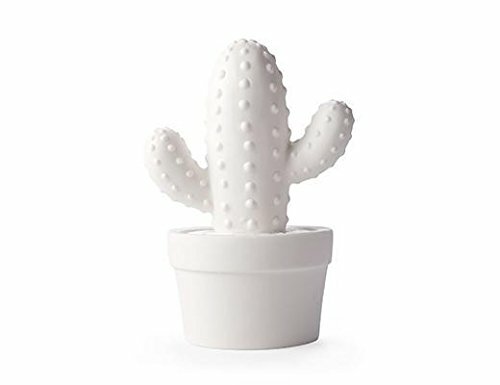 Brighten up your desk with this prickly fellow. 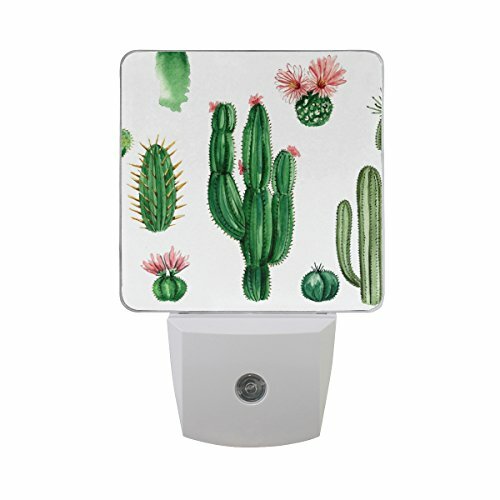 The Cactus Lamp is a great addition to any room, and thanks to the reusable stickers included; you can create whatever face you wish! This fun lamp looks great on your desk, shelves, or even your mantelpiece and is dual powered, meaning you can power it with a USB cable or AAA batteries (batteries not included). Bring a smile to your room and those within by creating whichever character you wish from the range of 43 reusable stickers. Why not make your cactus a cat? Or a dog? Or you could give it a nice big moustache. It's up to you! This lamp is 18cm (7") and is touched on and off. 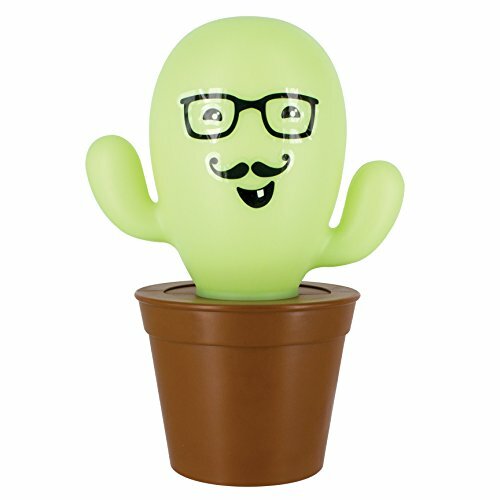 The Cactus Lamp is a part of Paladone's My Kawaii range. My Kawaii is a fun and funky range of accessories that draws inspiration from the quirky and adorable designs that come right out of Japanese pop culture. With cartoon-esque super-fun characters, from cute critters like cats, dogs and llamas, to smiley fruits, plants and even food, the My Kawaii range is perfect for people who like vibrant bright colors and lots of fun! Lamp is battery or USB powered. 3x AAA batteries are not included. DIY CACTUS MARQUEE LIGHT - Easy and cheap!